That view is changing. Inequality has burst onto the economics research scene. If we are to talk about that political economy then yes, we agree that the change has happened. We do not project this cynicism onto Professor Thoma's views, of course, but we do think we know why the change has occurred. Because the answers to that first set of questions were correct. Things like the Washington Consensus (essentially, a list of stupid things you shouldn't do to an economy) were correct. Don't do these things, don't mess with markets where they do work and economic growth will happen. The adoption of those simple rules: let markets alone in those areas where they do work, has led to the greatest reduction in absolute poverty in the history of our entire species. The questions were asked and answered and the answers to those questions were correct. But of course that's not enough for some people. We too are entirely happy to agree that pure unadorned markets do not work in all circumstances. There are interventions, things that only government can do and which also must be done, that must and should be made. However, it's a very human desire to want to be able to plan the world in one's favoured image and a societal instruction set which says "intervene in these small and limited areas, otherwise leave well alone" just isn't going to be emotionally or professionally satisfying for all too many in the field. And thus inequality. An excuse to do all sorts of societal management, management and fiddling that the answers to the previous set of questions ("How do we make the poor rich?" "How do we make all richer?") largely preclude, as people who would wish to manage society for emotional reasons would prefer. As an example we think of the work of Piketty, Saez and Zucman. It's entirely clear in the economics of taxation that transactions taxes, wealth taxes and capital taxes are to be abjured. They make everyone poorer to no good reason. Yet if we start shouting about inequality then we can impose those things which we know to be deleterious. That is, the concentration upon inequality is simply a result of people desiring to do those things that the previous set of answers say not to do. So, obviously, change the subject and quickly. Yes, this is cynical: but then we are about the motivations of our fellow humans. Oxfam has spent decades arguing that the only solution for abject poverty is that the rich world transfer more to the poor. Recent decades have shown that the cure for abject poverty is for rich people to buy things made by the abjectly poor in abjectly poor places. But there is still that very strong desire to tax the heck out of the rich: so the same original policy is now proposed it's just using inequality, not poverty, as the excuse. We are being less cynical about Oxfam there than we are about economics in general. 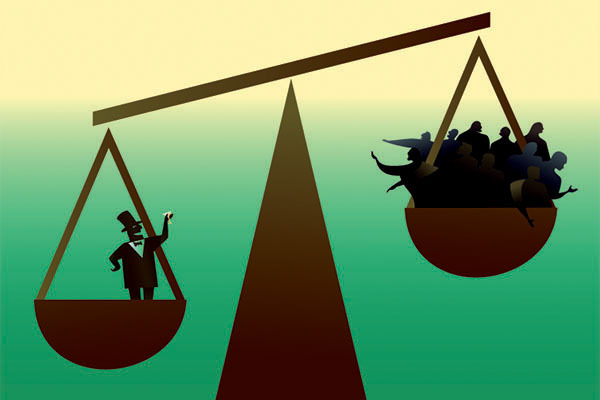 As it happens inequality is a problem which is going to go away of its own accord. Global inequality, as a result of that fall in absolute poverty, is falling. And in country inequality is going to start falling as a result of the change in demographics. The last few decades, as we added those poor to the global economy, have seen a relative rise in the amount of labour compared to he amount of capital. The returns to, the price of, capital have thus risen. The working age population, globally, started falling relative to the supply of capital last year. Thus inequality will decrease for the opposite reason that it increased. It's a self-solving problem: but that won't stop the calls to soak the rich for of course the soaking is the point, the answer whatever the question is. All we've got to keep an eye out for in the future is the next reason they'll give for the policies they so desire. Who knows, they might even come up with a valid one one day.